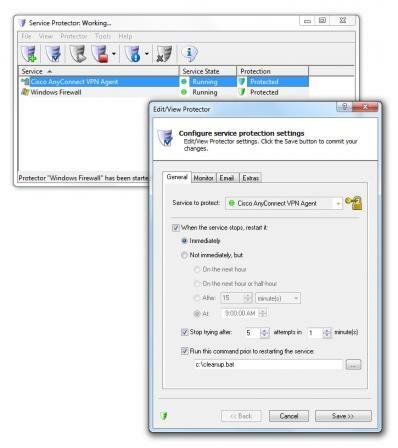 Service Protector monitors your mission critical Windows Services and keeps them running 24/7. Service Protector will automatically restart your service if it crashes, hangs, hogs the CPU, uses too much memory, or fails your own customized failure-detection procedure. And regular, detailed email from Service Protector will let you know about crashes and other relevant events. Service Protector is easy to use, affordable, and free to try, so why not see how it can help you to avoid those annoying 3 AM support calls?